There has been an awakening. Have you felt it? The Star Wars fan base has plenty of reasons to be excited about in 2015 thanks to The Force Awakens, but one currently stands above all — or more specifically, its toy does. The world wants BB-8, and toy maker Sphero knows it. Pretty much the moment it trundled across the sands of Jakku, BB-8 leapt into the hearts of even the most jaded Star Wars fan, and perhaps even more so since it made its physical début at Star Wars Celebration, confirming it was an actual piece of technological wizardry rather than a CG effect. But Star Wars is almost as much about toys as it is about the movies themselves, so honestly, the real question already is: Where the hell is my R/C BB-8? I mean, look at the excitement that came about from the toy getting a product page on a store website earlier this week. People are excited for a wee little droid of their own. Is This Our First Look at Sphero&apos;s Official The Force Awakens BB-8 Toy? Tech company Sphero, who both worked on the actual BB-8 prop and will release an R/C BB-8 toy seem to be listening intently to the fan chatter. 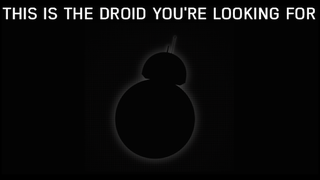 Their own website now has a dedicated page teasing their BB-8 toy (of course they use the “droids your looking for” joke), and you can even sign up to get email updates for it. I know this is Star Wars we’re talking about, but let’s take a step back and think about this for a second: You can sign up to get email newsletters. For a toy. Of a little robot. That we know nothing about — what it looks like, how much it is, what it does. That’s in a movie that won’t be out for 8 months. A movie we’ve seen about three minutes of footage for. And yeah, I totally signed up for the email updates.